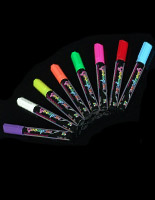 Set of 6 fluorescent colors - black, white, pink, yellow, light blue & green. Wet erase ink for use on non-porous surfaces. 1/8" Bullet tip to create thin lines. How do chalkboard markers work? 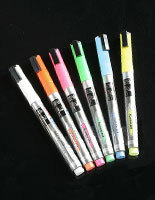 Fluorescent pens, such as the ones seen here, are primarily for wet-erase use. The chalk ink of the writing implements has the appearance of paint, but cleans much easier! 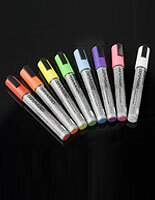 Chalkboard markers, also called chalk ink writing utensils, can therefore be wiped clean with a damp cloth. Retail stores often use these writing utensils to create eye-catching storefront windows. 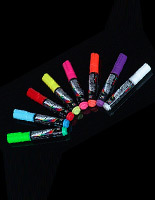 These fluorescent chalkboard markers are sold in sets of 6 brightly colored, liquid chalk pens: black, white, pink, light blue and green. These neon colors help to create attractive signage, sure to draw a crowd. 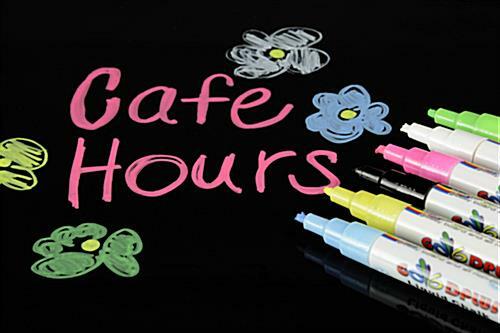 These chalkboard markers that work on glass windows can be used to write out store hours, bistro specials, seasonal signs and more! The ease of cleaning is an ideal feature with locations needing to update their written signage often. Chalkboard markers that wipe clean can also be used by car dealerships to handwrite vehicle prices, for shoppers to see from the road. 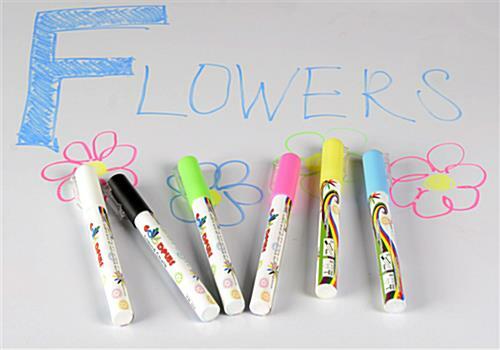 Chalkboard markers that are wet erase can also be used on other non-porous surfaces. A bistro could use the liquid chalk pens to write on traditional chalk boards. 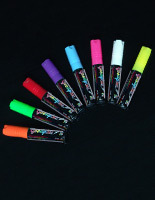 These are also chalkboard markers with 1/8" bullet tip, to create thin lines. 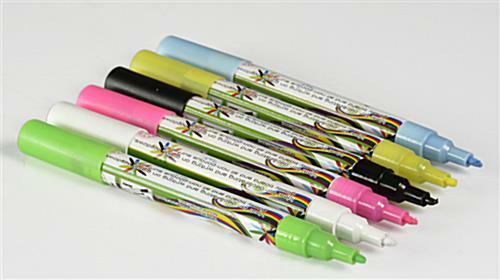 Teachers can use these wet-erase, fluorescent pens to draw out daily lessons. 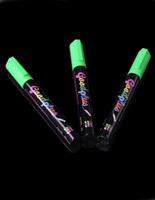 The wet erase neon pens, chalkboard markers produce far less dust and debri than traditional stick chalk. This feature is key for classroom use, especially around those with dust allergies. 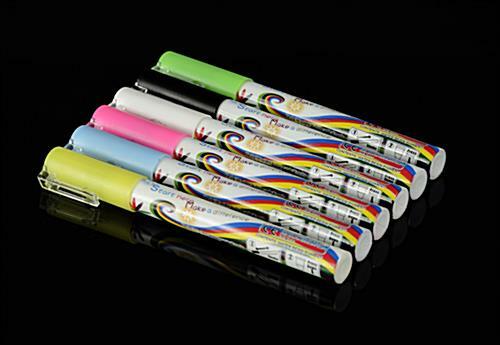 The wet erase chalk ink can be easily cleaned in mere minutes!